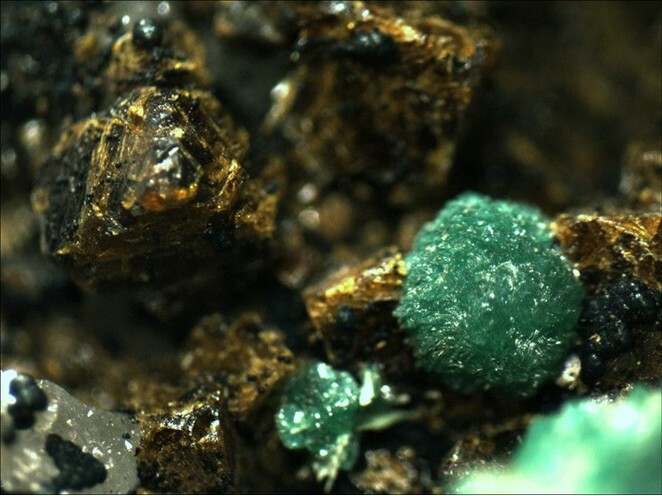 Arsentsumebite: Mineral information, data and localities. Emerald-green, grass-green, apple-green, pale bluish green. Named by L. Vesignie in 1958 in allusion to the composition, being the ARSENate analogue of TSUMEBITE. Brackebuschite Group. The arsenate analogue of Tsumebite. Single crystals are generally pale. Crystals distorted in aggregates and crusts. Harvard University, Cambridge Massachusetts, USA - #134586. Oxidised zone of a dolostone-hosted hydrothermal polymetallic deposit. Azurite 79 photos of Arsentsumebite associated with Azurite on mindat.org. Cerussite 20 photos of Arsentsumebite associated with Cerussite on mindat.org. Malachite 19 photos of Arsentsumebite associated with Malachite on mindat.org. Bayldonite 10 photos of Arsentsumebite associated with Bayldonite on mindat.org. Anglesite 10 photos of Arsentsumebite associated with Anglesite on mindat.org. Duftite 9 photos of Arsentsumebite associated with Duftite on mindat.org. Beudantite 8 photos of Arsentsumebite associated with Beudantite on mindat.org. Mimetite 5 photos of Arsentsumebite associated with Mimetite on mindat.org. Quartz 4 photos of Arsentsumebite associated with Quartz on mindat.org. Linarite 3 photos of Arsentsumebite associated with Linarite on mindat.org. Vésignié, J.P.L. (1935) Présentation d'échantillons. Bulletin de la Société française de Minéralogie: 58: 4-5. Bideaux, R.A., Nichols, M.C., Williams, S.A. (1966) The arsenate analogue of tsumebite, a new mineral. American Mineralogist: 51: 258-259. Chudoba, K.F. (1974) Arsentsumebit. Handbuch der Mineralogie: 4: 5-5. Zubkova, N.V., Pushcharovsky, D.Yu., Giester, G., Tillmanns, E., Pekov, I.V., Kleimenov, D.A. (2002) The crystal structure of arsentsumebite, Pb2Cu[(As,S)O4]2(OH). Mineralogy and Petrology: 75: 79-88. Frost, R.L., Palmer, S.J., Xi, Y. (2011) Raman spectroscopy of the multi anion mineral arsentsumebite Pb2Cu(AsO4)(SO4)(OH) and in comparison with tsumebite Pb2Cu(PO4)(SO4)(OH). Spectrochimica Acta Part A-Molecular and Biomolecular Spectroscopy: A83: 449-452. The following Arsentsumebite specimens are currently listed for sale on minfind.com. Kolitsch, U., Gröbner, J. & Brandstätter, F. (2009): Neufunde von Les Montmins, Allier, Frankreich. Lapis 34 (11), 24-32; 54 (in German). Lapis No.7/8 1999 p.70-74; Rieck, B., Kolitsch, U., Voudouris, P., Giester, G. and Tzeferis, P. (2018): Weitere Neufunde aus Lavrion, Griechenland. 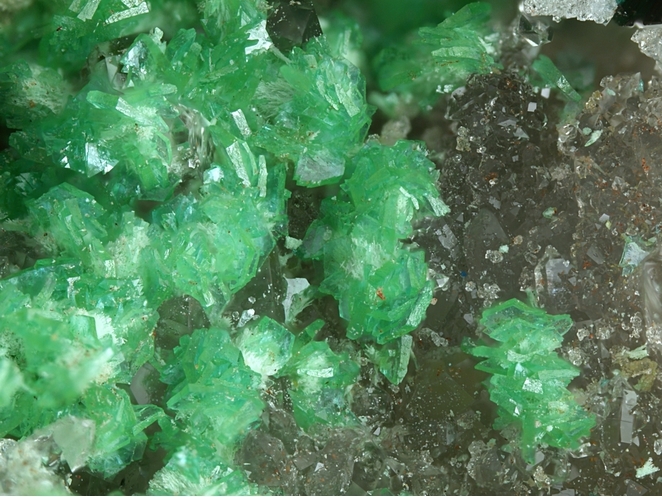 Mineralien-Welt 29 (5), 32-77 (in German). Giarduz, M., Marengo, A., Bittarello, E., Bracco, R., Rocchetti, I., Fassina, B., Ciriotti, M.E. (2018) Aggiornamento su nuovi minerali del comprensorio di San Giorgio di Comeglians (Udine). Micro, 16, 2-2018, 86-90. Calvo, M. (2015). Minerales y Minas de España. Vol. VII. Fosfatos, Arseniatos y Vanadatos. Escuela Técnica Superior de Ingenieros de Minas de Madrid. Fundación Gómez Pardo. 479 págs. Trevor F. Bridges, David Green, Michael S. Rumsey and C. Michael Leppington (2011) A review of the mineralisation of the Roughton Gill mines, Caldbeck Fells, Cumbria: Part 3 Roughton Gill Mine Journal of the Russell Society 14:3-23. Analyzed by the University of Arizona. Sugar White collection; Adams, Paul (2010) The Brown Monster and Reward Mines Inyo County, California. 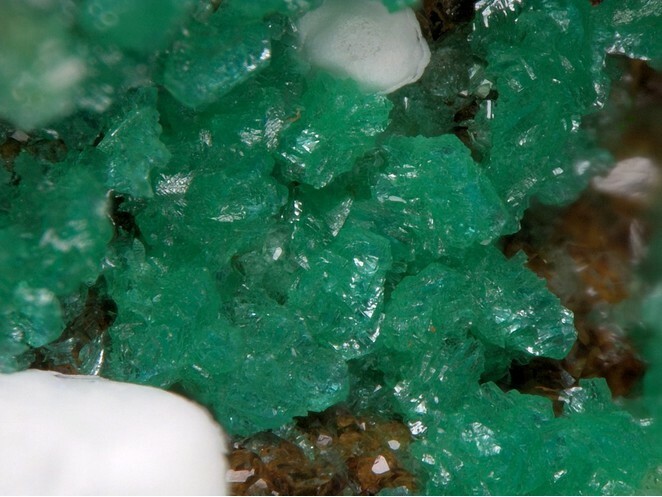 Mineralogical Record 41:175-193. Ford, Eugene (1994), Personal communication to John Dagenais, re: XRD results March & April, 1994. Collected by and in the collection of Brent Thorne and William Wise. Analyzed by XRD. Collected by and in the collection of Brent Thorne. Analyzed by Bill Wise.